Weighing only 600g and measuring only 312.5 x 55.5 x 40mm in size, there scanner's ultra compact body allows convenient portability to your home, office and just about anywhere in one hand. The preinstalled scanning utility provides plug-and-scan capabilities. When the feed-tray-power-link is enabled, simply opening the feed tray turns the scanner on and makes it ready to scan. The P-208II draws power from a single USB port, eliminating the need for a dedicated power cable and reducing clutter around the scanner. 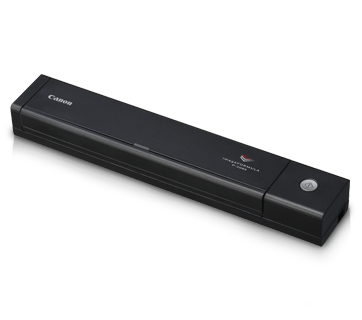 The P-208II provides the function of a desktop scanner, despite its compact size. The ADF allows you to set up to 10 documents for scanning at one time. One-pass duplex scanning is also supported, with scanning speeds of up to 8ipm / 16ipm in both grayscale and colour.